This debut collection of stories by Anjali Sachdeva explores how our new gods are just as untrustworthy and capricious as the old ones. Redemption — the act of being saved or saving something — is the central doctrine of most religions and one that is not only blindly believed but also often pursued in paradoxically destructive ways. Whether rooted in the desire to be delivered from the penalties of personal sins or those of the larger world, this mysterious hope for salvation is also, often, a driving conviction within the traditionally non-religious person in the form of a glittering and elusive promise of wholeness within oneself. 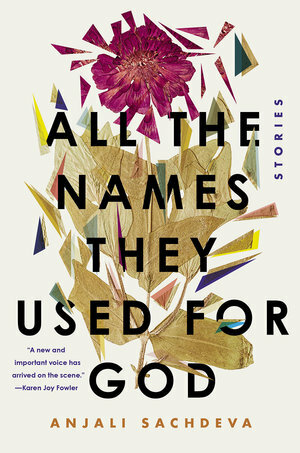 In her striking debut short story collection, All the Names They Used for God, Anjali Sachdeva's characters also reach for various kinds of redemption—inexplicable, undefined, mystical, even sublime. That reach propels them into curious liminal spaces that are not exactly darkly terrifying or horrific, as one might expect, but rather enchanting and mesmerizing. In her introduction, Sachdeva writes about the difference between how people approached their gods in the old times versus how they do now. She posits that, in present times, there are higher expectations and ideals regarding transcendence and, when these are not easily met by religion, people turn to science, technology, nature, etc. But these new gods are, of course, just as untrustworthy and capricious as the old ones. That introduction and some of the subsequent stories call to mind Neil Gaiman's American Gods (William Morrow, 2017), which is about how immigrants to any new place bring their old gods/spirits with them and how their belief systems weaken/alter so that new gods representing new obsessions with things like media, celebrity, technology, drugs, etc., take over and mostly lead to unfavorable ends. However, Sachdeva's descriptions of the new gods her characters pursue is not quite so bleak. Though Sachdeva's nine stories cannot be called cheerful exactly, the protagonists are all driven by some kind of hope. Their individual journeys are almost like the spiritual phenomenon of ascension (entering heaven alive, without dying.) Each one seems to have his/her own version of a place or state of being that is heaven-like or god-like—one that is not even clear to them, yet enticing them on with intermingled fear and desire. It,s rather mysterious to us readers, too, but we are compelled to root for them to get there, which they somehow do eventually. One of the delightful aspects of this collection is that the people, times, and places are from various parts of world: from war-ridden Nigeria to ocean-bound Newfoundland; from medieval England to an urban American near-future; and from a wintry American prairie to a seething Egyptian desert. A particular standout is the story, 'Glass-lung'. Set before WWI, it's about a Danish immigrant who has a terrible near-death accident while working in an American steel mill. He is widowed and, to support them both, his young daughter finds work as a museum curator's assistant. This curator convinces father and daughter to accompany him to the deserts of Egypt to find buried treasure. Father and daughter have their own reasons—the latter is in love with the curator while the former is, well, in love with a magical piece of fulgurite the curator owns. The desert works its particular charm on all of them in various ways but it is the old, damaged father who finds transcendence. With the father-daughter and curator-assistant relationships, Sachdeva's writing is carefully textured and nuanced. Each key scene—the steel mill accident, the desert thunderstorm—is also unfolded at just the right pace. The opening story, 'The World by Night', is another gem for similar reasons, especially the intricate word pictures of the subterranean caves. The title story is based on the 2014 kidnapping of the Nigerian schoolgirls by the terrorist group, Boko Haram. It follows the lives of two schoolgirls through their captivity and beyond. It would be impossible to point out why it did not work as well as it should have without giving away significant plot details, so we will leave it there. Intriguingly, with each story, the protagonist has a helper who is integral to the plot for that very role. Barring maybe three exceptions, that helper is another human being without any supernatural abilities. It's interesting to see how this fits in with Sachdeva's introductory points about seeking transcendence with new gods. The implication is, perhaps, that such seekers cannot get too far in their quests without help from others. Overall, Sachdeva's openings are not always strong but almost all her endings artfully leave space for the reader's mind to linger, wonder, and imagine what might happen next. She's at her best when describing a protagonist's close encounters with the mystical and in near-otherworldly settings: the fisherman and the mermaid in the ocean, the near-blind woman in the underground caves, the glass-lunged invalid in the desert storm, etc. Still, those pivotal moments could have been richer, could have transported readers more intensely into those spaces/worlds if the language/sentences had been more enthralling, more spellbinding. It seems as if the writer restrained herself and, consequently, her characters. In fact, some of the stories are even reminiscent of Aimee Bender's and Kelly Link's excellent speculative works, but not entirely as captivating. That said, the book has received accolades from several well-respected writers: Anthony Doerr, Chris Offutt, Dave Eggers, Kelly Link, Kevin Brockmeier, Carmen Maria Machado, and Karen Joy Fowler. That's high praise indeed and, perhaps, it raises expectations rather too much. Storytelling is also, of course, a way of reaching for redemption. We try to give narrative coherence to the events, fictional or real, of a life so that some meaning or purpose emerges. We hope that the ability of a story to yield such meaning or purpose does not end with its crafting or reading and that it will, eventually, drive some sort of cognitive reframing among those who encounter it. In a world still torn apart brutally by old-school religion ideologies and dogma, it's fascinating to peer closer at the powers and glories of the many newer forces drawing us toward them. This collection of stories does just that. It's a promising introduction to a fine writer from whom we will see, let us hope, bolder, riskier, more magical storytelling in the future.